Home > nurburgring > Nissan Says "We Didn't Cheat"
“Quite simply we're not going to get into a war of words with Porsche,” said Nissan's European spokesman Neil Reeve. “The final word from us is that it was done on absolutely standard tyres which are available to customers in the showroom.They're not trick tyres – absolutely standard tyres, normal road tyres. 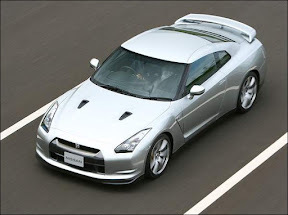 “The GT-R comes with Bridgestone and Goodyear (Dunlop). One tyre gives slightly better times around the 'Ring. “We did it on Dunlop. They're available with the car,” he said. See, for everyone that asks about the tires on Nagtroc, even Nissan says the Dunlops are faster. “The people who'd buy a GT-R or 911 Turbo are not the type of people to make a purchase like that lightly. They going to do an incredible amount of research, they're going to read every single road test that's available in every magazine which is on the internet and they're going to draw their own conclusion. Will it put doubt in their mind? They might find it surprising. In our experience in Europe, the GT-R has widely matched, at least, if not beaten, the 911 Turbo on various track tests. They can draw their own conclusions. We have seen it in most of the tests run here in the US and Europe. “It's great to have the competition. We're absolutely proud of the GT-R. It's a fabulous sports car, really epic. We are never going to get a head to head unbiased test. Just not going to happen. Its not in either parties interest.